Good luck in business. 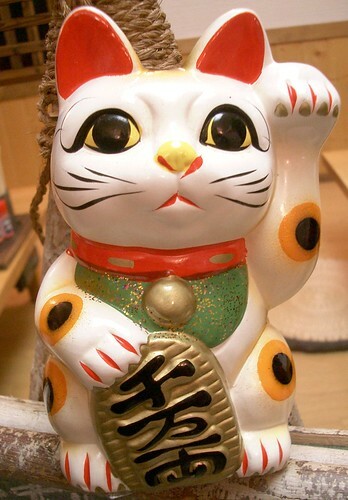 The famous Japanese maneki neko or inviting cat is said to encourage business to ones establishment. The raised paw is imagined to be baking a downwards beckoning movement inviting people in. Little do the Japanese know that the Westerners beckon with their palms upwards. Beckoning with the palm down would only be directed at animals. The Cat also acts as a burglar deterrent. Why? I think it is because these are often used as piggy banks. And they look cute. So a robber comes to the home, steals the piggy bank but thinks "These people are nice, they like cute things" and goes away without cracking the safe.